How to control the speed of an Image Sequence? I know I can do that for a movie clip, but the Image Sequence won’t give me that same Speed control. I’m not sure if this is what you’re trying to do. When you create an image sequence the default is to create them at one frame per image. You can’t change the speed using the speed control. 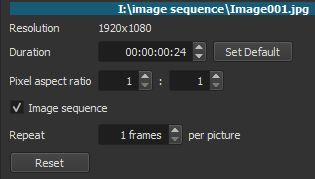 You can, however change the frame rate of the sequence so the image sequence goes by slower. The way to do that is. Click the properties tab. Change the frames from 1 to however many you want. Left click anywhere in the properties tab. The image sequence will reload and each image will play for however many frames you set it. You can put the sequence in the playlist. And If you want you can add it to the timeline. The original sequences frame rate can be modified as many times as you want. I was thinking I would have to load each one to the timeline and then edit the left and right sliders, but it seems there is a much better way? Could someone please step me through exactly what I need to do with the images, it might need to be really basic I’m afraid as I’m a new user. What you trying to do is very simple. If all your images are in a folder, simply drag and drop the folder to the playlist pane. This will add all the images in the folder to the playlist. To add all the images to the timeline left click the hamburger button , select add all to timeline. If there is no video track in the timeline V1 will be created and all the images will be added to it. Open an image in Source. In Properties change the Duration to a few frames. Then, do as @sauron suggested. Thank you very much shotgun and sauron, that’s worked perfectly!